It is Valentine's Day and author Dan Rhodes has a plethora of articles in the newspapers relating to his wonderful new book of short short stories Marry Me. Our favourite article is this top 10 for The Guardian which chooses a Library of Wales title as number 6. Better than the gift of flowers, although some of the Parthian team got them too. If you have a friend who is about to marry somebody hopelessly incompatible and is planning on living with them in a large, isolated house without electricity, you must do everything you can to get them to read "A Country House" from this collection. It might just give them pause for thought. Please read this overlooked masterpiece. I bet you don't - I'm always on about it, but nobody ever listens. Buy Rhapsody from the Parthian online bookshop for £7.99. This title is also available as an ebook from all good online outlets including Gwales.com and Amazon. "If ever there were summer days with long, long shadows they were those of 1930s, when to live in Wales was to sense the far off dramas being played out as the Holocaust began its evil, as Hitler started his demonic rise, even as a myriad tragedies, personal and familial were enacted in the starving terraces of south Wales and elsewhere as the Great Depression strip-mined hope itself. It was a decade of other changes, too, not least technological…"
"Suddenly, some anonymous futuristic man, a long way away in a power house, touched some gigantic switch and the lamp-posts jerked to life; and, though it was not dark, the electricity demarcated the country from the town more absolutely than any fumbling sunshine of a windy summer afternoon"
Author, Broadcaster and Raconteur Jon Gower has undertaken the challenge to read all 33 titles in the current Library of Wales series, and review them. Are you joining in too? Do let us know. Buy: Ash on a Young Man's Sleeve from the Parthian online bookstore for £7.99 ebook version coming soon. Our January enewsletter contains updates on news, events, book launches and special offers on classic titles in the Library of Wales range as well as related titles also published by Parthian Books. Click here to read the January 2013 enewsletter online. Click here to sign up to receive future editions of the Library of Wales enewsletter. Click here to read the Parthian Books Jan/Feb 2013 enewsletter online. "There cannot be a Library of Wales volume more laden with poignancy. With that terrible hindsight that comes with knowledge of his early death, pretty much everything the Cwmaman born poet and writer Alun Lewis penned is tinged with shadow, the sure knowledge that his writerly promise will be expunged. Death hangs like a tropical musk in this green tree. It came with a close-range shot to Lewis’s head, during the Burma campaign against the Japanese, the fateful revolver by his side. What seemed like suicide was deemed to be an accident, a military tribunal deciding the man had tripped. We shall never know the truth but reading the missives and tales is an act akin to reading Sylvia Plath’s fatidic poems, the lines seemingly seeping gas, or the late and final poems of mid Walian T Harri Jones, who hints at death by drowning, just before he drowns in the sea off New South Wales." For January 2013 Margiad Evan's Country Dance and - new and digital-first for 2013 - W.H.Davies' Autobiography of a Super-tramp join a lengthening list of Library of Wales titles now converted to ebook formats. Parthian have been developing an ebook list since 2010. We are currently converting front list titles, and select titles from our backlist including titles from the Library of Wales series. It's not possible to buy ebooks direct from the Library of Wales or Parthian websites, but Kindle and epub files can be easily located online from a variety of retailers, including Amazon, Waterstones, Gwales, Apple, and many others. Click here to buy these titles via Amazon's Kindle Store. Fancy having a go at reviewing an ebook? Email a 100-500 word review of a Parthian ebook to claire_parthian@ymail.com. The best reviews will be selected for display on the Parthian or Library of Wales websites and one review per month will be chosen to win free copies of our recent print titles! We have more excellent titles joining the Library of Wales series this year. Starting off this Spring/Summer season with Autobiography of a Super-tramp by W. H. Davies. Of Autobiography of a Super-tramp, George Bernard Shaw said ‘I have read it through from beginning to end, and would have read more of it had there been any more to read’. When Bernard Shaw first read the Autobiography in manuscript, he was stunned by the raw power of its unvarnished narrative. It was his enthusiasm, expressed in the Preface, that ensured the initial success of a book now regarded as a classic. At twenty-two, poet and hard-drinker William H. Davies' restless spirit of adventure took him to turn-of-the-century America, where he worked around the country taking casual jobs where he could, thieving and begging where he couldn’t. Autobiography of a Super-tramp recounts his experiences; richly coloured by the bullies, tricksters, and fellow-adventurers he encountered. He was thrown into prison in Michigan, beaten up in New Orleans, witnessed a lynching in Tennessee, crushed his foot under the wheels of a freight train while attempting to jump aboard with fellow tramp Three-fingered Jack, and got drunk pretty well everywhere. Best known for his poem 'Leisure' (‘What is this life if, full of care / We have no time to stand and stare...’), W. H. Davies was unable to settle to regular work and spent a significant part of his life as a tramp, living in shelters and doss-houses in London, but began publishing his own poetry in 1905, and became a popular poet in his time. Never before published, and written ‘at white-heat in three weeks’ in autumn 1967 after two visits to the detention island of Léros in the Greek Dodecanese, The Protagonists (paperback, £7.99) is Brenda Chamberlain’s response – both heartbreakingly lyrical and disturbingly visceral – to the right-wing Colonels’ Coup of April 1967. Editor Damian Walford Davies describes the play as ‘a work to which her whole oeuvre can be said to gather'. A dangerous, dissident text that draws on the conventions of Absurdist theatre, The Protagonists is the dark culmination of Chamberlain’s profound, career-long exploration of individuality, belonging, incarceration, imaginative freedom and the social role of the artist. It is also a startlingly candid articulation of her own emotional and psychological ‘internment’ at this time. Brenda Chamberlain: Artist and Writer is the first full-length biography of Brenda Chamberlain, chronicling the life of an artist and writer whose work was strongly affected by the places she lived, most famously Bardsey Island and the Greek island of Hydra. Brenda Chamberlain lived a life of artistic engagement with the world. She published a compelling body of literary work and held solo exhibitions in London and Wales, while her work was shown in over thirty group shows. Her brilliance was mirrored by the journey of her personal life, including marriage to fellow artist and Royal Academy student John Petts, the long relationship with the Frenchman Jean Van der Bijl, the life-long friendship with the German aristocrat Karl von Laer and her eventual journey to Hydra where she lived for many years before returning to Bangor, Wales. In this biography, exhibition curator, consultant and writer Jill Piercy draws upon extensive research gathered from public and private collections and from interviews with Chamberlain’s friends in Britain, Germany and Greece. Following on from the warm reception of his novel A Kind of Loving, we're beginning 2013 with a selection of the best of Stan Barstow’s stories covering the last five decades of British life. The stories of The Likes of Us (paperback, £11.99) follow a group of young tearaways on a night out that begins with horse-play and ends in tragedy; the loneliness of a drunken miner’s wife; a war-shocked ex-sailor forced beyond endurance, a widower is brought to grief by a woman outside his real understanding, and a factory worker finding his way through the physical world of his marriage. Real and involving, “master storyteller” (The Times) Barstow’s stories are urgent slices of life, men and women struggling and succeeding to come to terms with The Likes of Us. Along with Alan Sillitoe and John Braine, Stan Barstow is considered one of the pioneers of the 1960s school of northern literary realism, and led the way for 'Brit-lit' authors like Nick Hornby. March will see publication of Mari Stead Jones's Say Goodbye to the Boys (paperback, £8.99). Based on notes she discovered in a wooden box belonging to her author father, Stead Jones, her debut thriller proves that writing is a gift one can inherit, and introduces Mari as a comic writer of the first order. In Say Goodbye to the Boys, a serial killer is on the loose in a sleepy, Welsh seaside town, picking off victims like some people pick cockles. The year is 1947 and three young men have recently been demobbed and are back at home in north Wales. It's the start of good weather and they're enjoying being alive. They share the favours of Lilian Ridetski, who runs more than a high class hair salon in the town. When she and others are found brutally strangled, suspicion falls on all of her customers. Blackmail and murder make Say Goodbye to the Boys both a dark comedy and a quick-witted thriller. It's also surprisingly tender, a portrait of old friendships lived to the gentle rhythms of a sleepy, wave-lulled town in the warm face of summer. This title is already available to download in ebook format for those too impatient to wait for its print publication. I Wish You Were My Father: R S Thomas & Me (paperback, £8.99) is a lyrical, and deeply moving memoir, with Lee McOwan's relationship with the celebrated Welsh poet and Nobel prize nominee RS Thomas at its heart. After remarrying and moving to Angelsey in 1990, Lee McOwan – a woman who had never met or known anything about her father – became involved in an unusual and deeply moving love triangle with the revered and so-called cantankerous Welsh poet and Nobel Prize nominee, RS Thomas, and Betty Vernon, the mercurial woman he had known for forty years and who became his second wife. Her story shines a light on the poet’s final years on the island, and the joys and sorrows of love and loss in old- and middle- age, interweaving the complex strands of their relationship, Lee’s education in Paris, her journey as a writer and psychotherapist, and evocative pastoral descriptions with RS Thomas’s poems and episodes of back-story illustrating his influence. Published at the time of his centenary, admirers of RS Thomas may be intrigued to read about a private, more gentle side of him: a gifted poet, but also man who also baked delicious cakes, and took his wife on a cruise. Above all this is a book for anyone interested in the redemptive power of the pastoral and the language of great poetry and literature, or anyone ever moved by profound love, betrayal or loss. Having written extensively about Modern Wales, and selected classic, and often experimental, texts as Series Editor of the Library of Wales series, Dream On is Dai Smith's own fiction debut, to be published in May 2013. There's Digger Davies and his one cap for Wales and ultimately untimely death; the award winning photographer whose return home will become a quest for his own forgotten identity and compromised life; the thwarted politician in a hospital bed writing his own obituary; and a beautiful girl caught in time, alive in an old man’s memory. It is a complex composite novel: part black comedy and flashlight noir thriller, part meditation on the stories that connect up the frayed wires in the business of living. There's Digger Davies and his one cap for Wales and ultimately untimely death; the award winning photographer whose return home will become a quest for his own forgotten identity and compromised life; the thwarted politician in a hospital bed writing his own obituary; and a beautiful girl caught in time, alive in an old man’s memory. The novelist and screenwriter Alun Richards from Pontypridd was a consummate producer of fine sentences, which in turn powered and coloured half a dozen novels, two cracking collections of short stories, along with stage plays, screenplays and TV series, including The Onedin Line, which took many viewers grippingly out to sea. In real life Richards wove his fine sentences into expansive, heart conversations, fuelled by great bonhomie and perhaps an early afternoon cocktail, stirred not shaken, the Mumbles way. Home to an Empty House, first published in 1973, is a little belter of a novel, with many, many of those trademark Richards’ lines, which are often side-splittingly funny and oftentimes deliciously scabrous. I can’t remember laughing so much in aeons. Author, Broadcaster and Raconteur Jon Gower has undertaken the challenge to read all 33 titles in the current Library of Wales series, and review them. 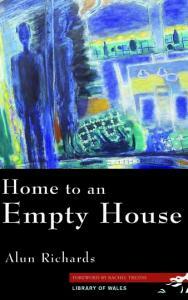 You can read his full review of Home to an Empty House on Wales Art Review now. Others are starting to join in the challenge, including Parthian Nu2 writer Joao Morais and his friend, the 'artist and vagabond' John Abell. Are you joining in too? Do let us know. Season's Greetings to you all. Have a lovely festive holiday. Julian Ruck on the Politics Show this weekend made a vague and inaccurate statement that there is no public scrutiny of the subsidy made to publish new editions of classic titles of Welsh writing in English in the Library of Wales imprint. This is said to be £50,000 for 50,000 sales of the 34 titles produced since the series started in 2006. The Welsh Books Council should have been given the chance on air to defend their extremely rigorous scrutiny via their panels and committees (also funded by that mythical 'taxpayer' Julian Ruck seems so concerned about). It was good to see the young English postgrads of Swansea university defend the series, and also the Politics Show's guest AMs Joyce Watson (Labour) and Peter Black (Liberal) reiterate their support for subsidy to publishing Welsh titles in English as well as making the case for the role of the wider arts in reviving the economy. Jon Gower is in the process of reading all 34 titles as part of his Library of Wales marathon. As he said on the Politics Show, it's not a matter of hospitals v books, but one of championing the role of literacy, culture and heritage within a 'grown-up nation'. Perhaps publishers and editors in this country may now be allowed to get on with their important work, including surveying and choosing the best manuscripts out there (including classic titles), supporting and developing living writers (both emerging and established), editing and producing their work to the highest standard, and selling those titles within a market that often seems to have its mind elsewhere. Support our industry by buying at least one literary magazine or book produced in Wales as a gift this Christmas. The Library of Wales series was a feature for debate on today's Sunday Politics Wales show aired on BBC One Wales. A call has been made for a scheme which republishes classic Welsh books that have gone out of print to continue to receive public funding. backs the Library of Wales series, which has sold 50,000 copies since it was launched in 2006. In total, 34 books have been published through the scheme, and Mr Gower said he was in the process of reading every one. "We look after castles and museums look after artefacts. Books are dead artefacts unless they're read," Gower told the Sunday Politics Wales programme. "In a Wales which has problems with literacy, having good books and encouragement to read such books is a good thing." Read the story in full, including an edited video of the feature from today's Sunday Politics Wales show, on BBC News. Watch the Sunday Politics show Library of Wales feature in full on iPlayer (about 48.35 minutes in).